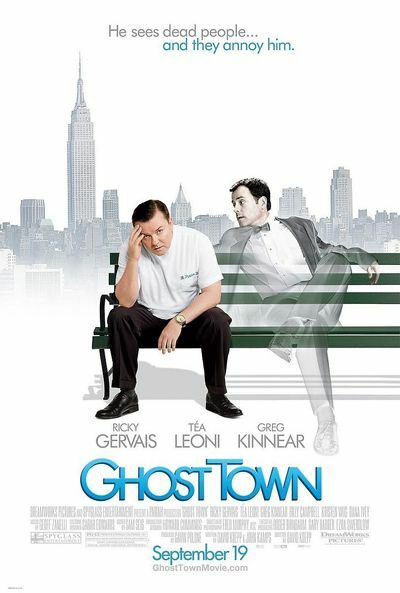 Story: In the comedy "Ghost Town," Bertram Pincus (Ricky Gervais) is a man whose people skills leave much to be desired. When Pincus dies unexpectedly, but is miraculously revived after seven minutes, he wakes up to discover that he now has the annoying ability to see ghosts. Even worse, they all want something from him, particularly Frank Herlihy (Greg Kinnear), who pesters him into breaking up the impending marriage of his widow Gwen (Tea Leoni). That puts Pincus squarely in the middle of a triangle, with spirited results. Ricky Gervais Bertram Pincus D.D.S.